Red Stripe about as Jamaican as Drake's "truss me daddy" accent. Earlier this year, two Miami residents sued Anheuser-Busch, the makers of Kirin, for false advertising claims. The plaintiffs argued that Kirin’s deceptive packaging—which bears phrases like “Imported” and “Japan’s Prime Brew”—lead people to believe the beer was brewed in Japan. AB-InBev lost the suit, and ended up refunding Americans who falsely thought Kirin was brewed abroad. The same thing happened this year with Beck’s pilsner, which is most definitely not brewed in Germany. Now, two individuals have filed a lawsuit against Diego, the London-based alcohol company that makes Red Stripe lager. 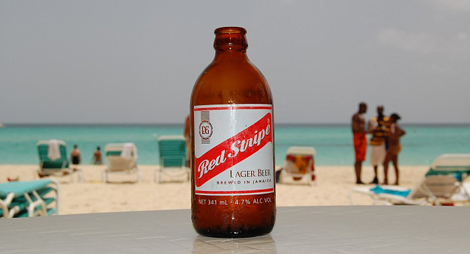 The plaintiffs claim that Deigo has tricked customers into thinking the beer hails from Jamaica, when in reality Red Stripe is brewed and bottled in Latrobe, Pennsylvania. The case argues that this “false advertising” allows Deigo to sell Red Stripe at substantially higher prices than domestic beer. Robbins Arroyo, the San Diego law firm representing the plaintiffs, explains how Diego leads consumers to believe Red Stripe hails from the Land of Wood and Water. But on the border of the Red Stripe label, it does in fact state that the lager is brewed and bottled in Latrobe, Pennsylvania. But Arroyo’s clients say consumer’s don’t see this writing because it is in “obscure white text” and not easily noticeable. What do you think: should it be the responsibility of the consumer to find out the provenance of their brew, or the responsibility of the producer and the distributor to be more transparent? All we know is, someone needs to start a GoFundMe campaign to help Red Stripe, just like they did for Meek Mill.